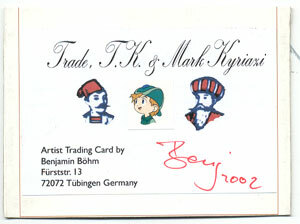 Böhm participates for the first time in the famous Artist Trading Cards (ATCs) of M.Vänçi Stirnemann in 2001. In his first edition of 20 cards artists whose work Böhm admires are provided with handsome heads, so "that the acceptance of these artists is rising in the public opinion" as Böhm says. Sadly these cards seem to be lost. 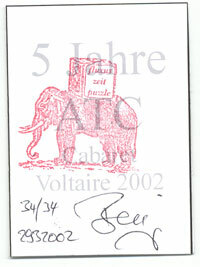 On occasion of the fifth birthday of the ATC in March 2002 there is a Trading Cards session in the Cabaret Voltaire, Zurich, in which Böhm participates. 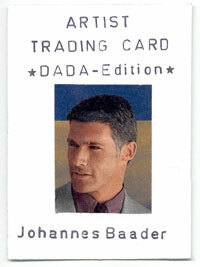 A new edition of artist-tradingcards featuring exclusively Dadaists is created for that event. The visit of this historical place still alive with aristic life is a special experience for Böhm. I gets to know a lot of artists, among them Gingersnaps for whose project working life ben at work should be created. A CD-Rom with pictures of this event at the Cabaret Voltaire can be found in the ATC-Archive. Further editions for the ATC-project are made. 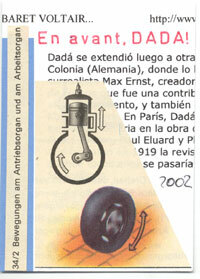 Online-articles are the basis for the edition En avant, dada (see right). Added dynamic-technical drawings and the order Go on, Dada! make these copies a support for the preservance of the historical site Cabaret Voltaire as a meeting place for artists, which at that time wasn't decided surprisingly. In the same period 'the brother Kyriazi' comes out (see below). 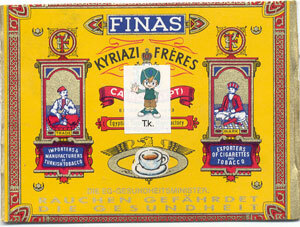 To the cover of a cigarette box of the mark 'Kyriazi frères' showing to oriental gentleman with the title 'Trade' and 'Mark' a third sibling is added, in this copy T.K.. The back shows again the three Kyriazi, thois time as portraits. The source for the added Kyriazi was a package of Digimon-Stickers. The ATCs appear in the official sets nr. 239 and 240. Other ATCs follow. 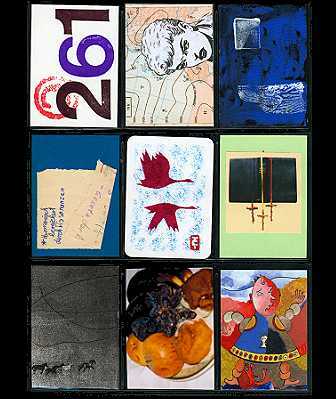 A variation of the foodscapes, cut-out food packaging as postcards this time in the size of ATCs, so called Artist Trading Post Cards in 2002. 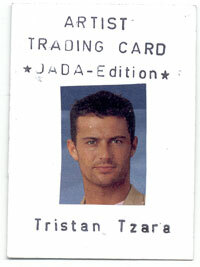 These can be found in the ATC Archive, official edition nr. 260. Mathetest 1984-2002 is another ATC-Edition of the year 2002. Starting point is a mathematical test Böhm undertook as a pupil and reused lateron as notepaper for musiclessons and again for this edition as a topic. Little drawings can be found. On the left parts of the ATC edition Nr. 261 with one copy of Mathetest (middle row, left) can be seen.